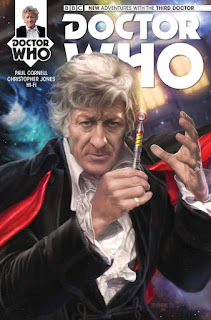 The Fellowship was fortunate enough to obtain a copy of DOCTOR WHO: THE THIRD DOCTOR #1 from Titan Comics. Paul Cornell writes, Christopher Jones draws, Hi-Fi colors, and Richard Starkings and Comicraft’s Jimmy Betancourt letter. The UNIT team responds to a report of a large vehicle landing in Bedfordshire, and brings Jo along for the ride. The Doctor, delayed by a chess game, joins the team to discover an apparent invasion force of machines of a sort the Doctor has never seen before. The Doctor cleverly repels the attack, and then returns to his lab for yet another kind of surprise. I’ve always liked the Pertwee incarnation; he’s a man of action, able to outfight as well as outwit his foes. Having UNIT underfoot always seems to help, as well. And this first issue does a lot to get us into the mindset of the third Doctor, and it does it quite well. The pacing is quick, and the art gives a sense of the familiar even when dealing with the unknown. This is a book that will take many of us down memory lane, and might also draw in readers who are less familiar with the Doctor and his TV adventures. Pick this book up today. DOCTOR WHO: THE THIRD DOCTOR #1 is available now at your FLCS or at titan-comics.com.